PRESCOTT, DeWltt Clinton, engineer and manufacturer, was born at Lockport, Ill., Feb. 25, 1841, son of Daniel Kimball and Lorenda (Lang) Prescott. Capt. Bickford Lang, our subject's maternal grandfather, served with distinction in the war of 1812. In 1845 Daniel Kimball Prescott, father of our subject, removed to Chicago, Ill., where he became county commissioner, dying while prosecuting the duties of that office in 1846. After his father's death DeWitt Clinton Prescott accompanied his mother to New Hampshire, where he attended school until he was twelve years of age, when for a short time he was employed as bobbin-boy in the Stark Cotton Mills in Manchester, after which he entered the service of the Amoskeag Locomotive Works, to acquire the trade of a machinist in the construction of cotton machinery. Later, he was employed in the Manchester Locomotive Works for about two years, when the works closed. He obtained one term of schooling during this time, and when the shops closed went to work upon the farm of Rev. John W. Ray who taught him mathematics during each evening. After six months he went to Boston, Mass., and entered the Boston Locomotive Works, three months later being sent by the company to Chicago, Ill., with a locomotive for the Chicago, St. Paul & Fond du Lac railroad; he was then not quite sixteen years of age, and the matter was considered an unusual responsibility for one so young. Thereafter he served the Chicago, St. Paul & Fond du Lac Railroad Co. as machinist, fireman, engineer, and foreman of a gang of machinists for about eight years. In 1862, to acquire a practical knowledge of the condensing engine, he became engineer of the propeller "Ontonogon," running between Chicago and Buffalo on the Great Lakes, after which he went to Colorado Territory and followed the business of engineering, both for the Black Hawk Mining Co. and the New York Gunnell Gold & Silver Mining Co. Two years thereafter he returned to Chicago and was employed upon the Chicago & Northwestern Railroad until 1865, when he became master mechanic of the Peshtigo Co., a prominent lumbering concern at Peshtigo, Wis., which operated a railroad in connection with their extensive mills. Two years later, in partnership with R. H. Trumbull of Waukegan, Ill., and Austin Cruver of Chicago, he founded the Marinette (Wis.) Iron Works, which grew rapidly, and though burned out in 1870, so prospered that in 1883 it employed a large force of men. In 1872 the co-partnership was dissolved, and the concern was incorporated as the Marinette Iron Works, with Mr. Prescott as secretary, but went down in the financial panic of 1893 and ended its career by dissolution. In 1890 the company built new and larger works at Duluth, Minn., and transferred its manufacturing business to that point. When the Marinette Iron Works Co. ceased business, Mr. Prescott organized a new company called the D. Clint. Prescott Co., and leased and operated both plants, the one at Duluth and the other at Marinette, until they were sold out by the bondholders of the old company. In 1899 the new company purchased and enlarged the Iron works at Menominee, Mich. Besides Mr. Prescott, this company included his sons Loren, Edward and Sumner Prescott. In 1898 he moved from Duluth to Chicago where he conducted the company's office in that city. The company has been reincorporated under the name of The Prescott Co., and is now (1920) in successful operation. Mr. Prescott was the author of a volume, "Early Day Railroading From Chicago" (1910), which is largely autobiographic in character. He was married July 30, 1862, to Sarah, daughter of Abraham Holgate of Leeds, Eng. The living children of this marriage are: Frederick Mars, Loren Locke, Edward Lang and Sumner Kimball Prescott, and Lillian, who married Nathan C. Kingsbury of New York, and Saide, who married Orville Taylor, Jr., of Chicago, Ill. Mrs. Prescott died in Chicago in 1911 and he was married June 26, 1912, to Fanny A. Case of Oak Park, Ill. He died in Chicago, Ill., May 4, 1918. 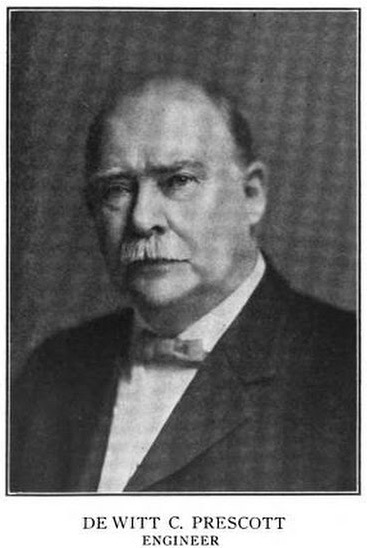 The National Cyclopædia of American Biography 1920.